Maria Lesko and Corey Hogrefe of St. Louis were married Sept. 30, 2017, at Immaculate Conception Catholic Church, Columbia, Fr. Carl Scherrer officiating. The bride is the daughter of Alan and Julie Lesko of Columbia. The bridegroom is the son of Mark and Souad Hogrefe of Chester. The maid of honor was Jennifer Lesko, sister of bride. Bridesmaids were Brooke Hogrefe, Stephanie Metter, Robyn Dexter, Erin Dexter, Channing Glover, Allex Oelkers and Natalie O’Leary. Allison Mason, cousin of groom, was the flower girl. The best men were Tyler Ludwig and Harley Story, friends of the groom. Groomsmen were Michael Lesko, Nick Tibbles, Aaron Grah, Jeffery Beers and Samuel Higgerson. Danny Rothermich, cousin of bride, was the ring bearer. Guests were seated by David Lesko, Kyle Shassere and Alex Buck. 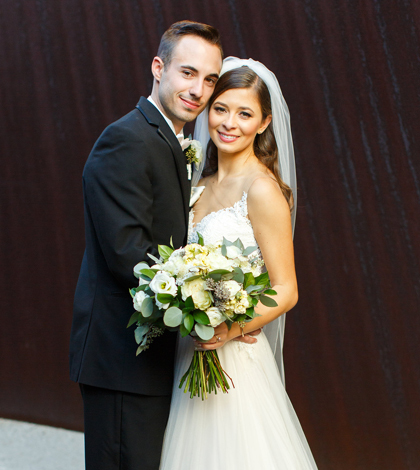 The bride is a 2011 graduate of Gibault Catholic High School, and a 2015 graduate of Maryville University with a Bachelor of Fine Arts in Interior Design. She is employed as the principal interior designer and owner of C&M Interiors. The bridegroom is a 2011 graduate of Gibault Catholic High School, and a 2015 graduate of Maryville University, with a Bachelor of Fine Arts in Interactive Design. He is employed as an interactive designer for Coolfire Studios.